LECOM’s main campus is located in Erie, PA, overlooking Lake Erie. The West Grandview Boulevard campus is less than a mile from Millcreek Community Hospital and just a few miles away from downtown Erie. Pennsylvania’s fourth largest city is a four-season tourist destination and commercial/industrial hub between Pittsburgh, Cleveland and Buffalo. LECOM Bradenton is just a few miles east of the Florida Gulf Coast and located in Lakewood Ranch, a master-planned community between Sarasota and Bradenton, FL. Tampa is less than an hour north of the campus. 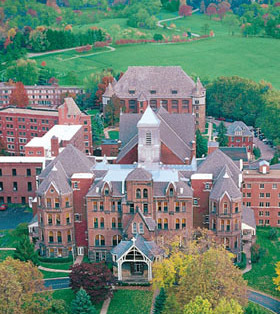 LECOM at Seton Hill is located on the campus of Seton Hill University. This additional location of LECOM Erie is located among 200 beautiful acres of tree-lined hills in Greensburg, PA. The campus is just 30 miles southeast of Pittsburgh.